Nowadays, chefs have a number of options to become an entrepreneur, beyond the typical work-and-save or partner with an investor options to open a brick and mortar location. Food trucks keep some roaming and mobile, but my personal preference is the “pop-up” type meals where chefs take over another restaurant. The newest entrant is Chef Ken Yau, who’s Monday night K Dinners take over Café Fiorentina, a day when the restaurant is normally closed. 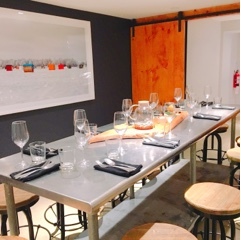 With seatings at 6:00pm and 8:30pm, a communal table about ten people will gather to break bread over 7-courses of seafood ($80). Chef Yau touts England’s The Fat Duck as an inspiration for his menu. 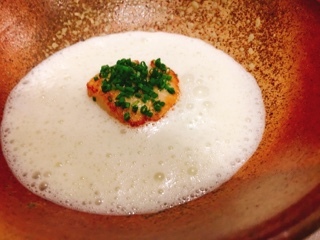 The famed Michelin star restaurant by Chef Heston Blumenthal is known for their molecular gastronomy using modern equipment and techniques to create one-of-a-kind dishes. The influence was best showcased in the amuse bouche and first course. 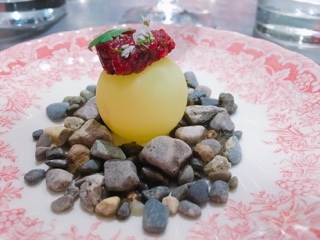 For the starter, a truffle-sized orb is perched on rocks and you’re advised to delicately place it inside your mouth, whole. 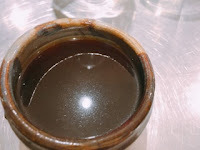 Bit through the thin chocolate-like shell and a flood of sweet pear juice augmented with citrusy yuzu floods the mouth, further contrasted with a salty relish on top. This is followed by fried fish skin dusted with salt and vinegar sushi rice, which puts any extreme flavour chip to shame, and green tea powder that’s supposed to bring bitterness to the fold (although you really couldn’t taste the matcha since it was drowned out by the vinegar). 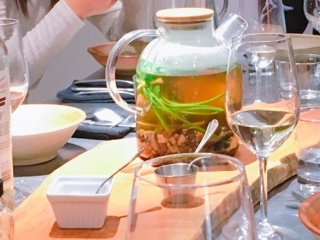 As a plate of mussels are brought to the table, Yau explains he works with a company that can cultivate them in small batches with customized flavoured growing environments. This batch of PEI oysters were grown with yuzu so no condiments are needed. 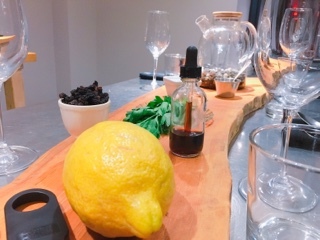 Sure enough, as one’s brought to the table, the typical sea-like aroma is replaced with the light scent of lemon. 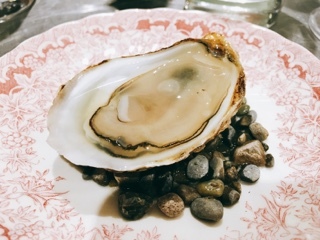 As it hits the tongue, the oyster’s juices are all at once citrusy, briny, and sweet. Refreshing elements continue with a squid salad. Pickling the squid makes it a bit chewy but the firmer texture and sour flavour is rather interesting. Sitting in a bed of saffron clam sauce, the savoury creamy condiment helps add a touch of richness to the otherwise summery course. 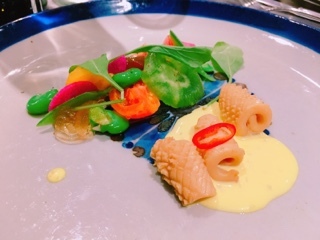 Meanwhile, the salad was everything but lettuce: juicy tomato slices, tomato water mixed with Riesling and juniper jelly, crunchy fava beans, and crisp radishes. The following seared scallop was one of my favourite bites of the evening, the meaty seafood wonderfully cooked so that it remained delicate and sweet. 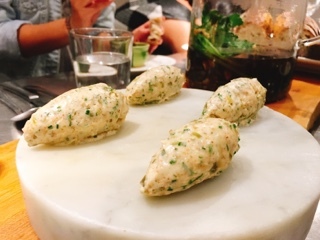 Crumbled segments of finger limes (citrus caviar) transformed the cauliflower purée into a smooth and crunchy concoction that made me yearn for another spoon. At the centre of the table, on a salvaged piece of wood, sat a lemon, morels, bunch of herbs, and a dark liquid. It wasn’t until the middle of dinner these were combined into a carafe filled with rocks and caramelized onion consommé (prepared over four days) and steeped to create an intensely flavoured French onion soup with a tom yum flair thanks to the white soy sauce, Madeira wine, and sherry vinegar. With the rich broth came warm crusty bread and a generous portion of whipped brown butter flavoured with capers, anchovies, and sherry vinegar for spreading onto the bread. We all agreed that we should have stuck with one slice (boy were we full at the end), if only the butter wasn’t so enticing. 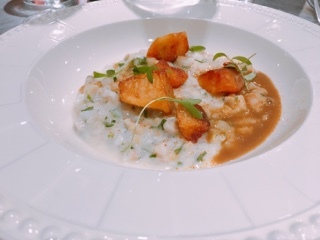 The following seafood risotto was another one of my favourite dishes of the night. 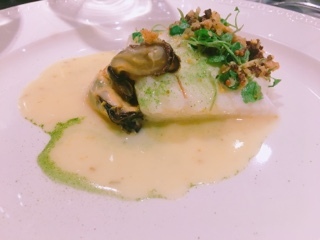 In Chef Yau’s version, in lieu of rice the risotto is made entirely from finely diced seafood (halibut, clams, prawns, etc.). Starch is added through pieces of fried potatoes, which also help add a bit of crunch to the creamy dish and everything is further enhanced with a thickened lobster sauce. It was wonderful, but a tad salty so would be even better if the seasoning was toned down. After such an amazing risotto the poached halibut was a mediocre ending. 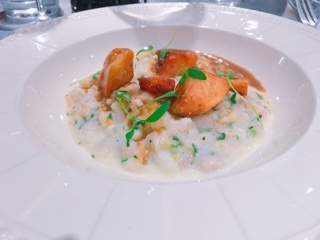 While I enjoyed the beurre blanc sauce dotted with plump mussel and crispy duck and chicken skin, the flavours were too close to the previous risotto. 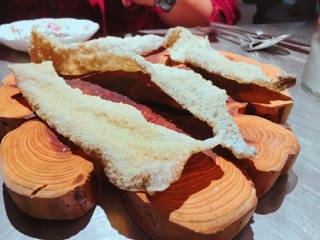 Moreover, the fish was left resting too long and the temperature lukewarm at best. Chef Yau should consider re-ordering the dishes (serving the halibut earlier on) or changing the fish’s accompaniments to something fresher and brighter. Regardless, in either case, the halibut needs to be hotter and the seafood risotto should definitely be the last dish. 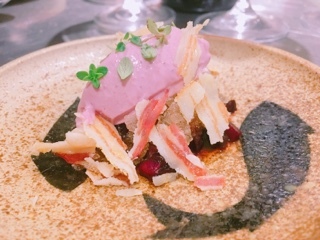 There was a sense of weariness when the dessert was presented, already Chef Yau prefaced the dish by stating desserts aren’t his thing. One taste and I agreed – there was too much going on in one dish: braised cherries, granite, creamy mascarpone, and thyme. Also, while sherry vinegar was already used throughout the menu, this favourite ingredient even made an appearance in the dessert and completely overpowered everything. I understand, chefs cannot be good at all things – after all, pastry chefs often dedicate their whole careers to perfecting desserts. If this isn’t your forte, just keep it simple (one friend commented how grilled peaches with ice cream would have been a great ending) or outsource the course to someone else (Japanese cheesecake anyone)? Renegotiating the seating arrangements with Chef Fiorentina are also required. Despite the restaurant being closed, the table was set in the basement on a table with bar stools. After three hours, the room became stuffy and warm and stools are best suited for a quick sandwich or ramen, not a long multi-course dinner. Despite the somewhat rocky ending, I was pleased with the overall experience at K Dinner. Having eaten at his premiere meal, I’m sure the kinks will be worked out as the operation matures. In speaking to Chef Yau, his word-of-mouth advertising is a success with his Monday dinners are already booked into mid-October. Small private dinners are coming to Toronto and eaters are devouring it. Is That It? I Want More! Copyright Gastro World. Powered by Blogger.